In addition to a new playing formula that will bring nations together for a weeklong tournament in a single venue, the Davis Cup is also implementing a new sponsorship strategy that will make tennis' top team competition look different to television viewers - all depending on where they are watching it. The group behind the new Davis Cup - led by Barcelona defender Gerard Pique - is planning to use virtual replacement advertising during broadcasts at the inaugural World Cup of Tennis in Madrid from Nov 18-24, meaning sponsors' logos and banners will be superimposed digitally on the courts. A viewer in the United States will see something different than one in Asia or one in Europe, or those watching matches in person at Madrid's "Magic Box" tennis complex. The strategy adds flexibility to sponsors and will allow organizers to sell different sponsorship packages worldwide, widening revenue possibilities. Instead of having one presenting sponsor for the whole tournament, organizers can sign deals with multiple companies. "One of the things that happens in terms of sponsorship is that it is pretty difficult to find one of those global brands that has interest all over the world," Kosmos Tennis CEO Javier Alonso told Associated Press. "With the modern technologies that are available right now on the market, we are targeting to have three or four different feeds and in each feed we will have a different sponsor with virtual replacement technology." Even global companies could take advantage of the new model, as they can promote specific products in different markets. A car company could advertise one vehicle in Europe and another in Asia, and a beer company could promote one product in South America and another in Oceania. The technology, called DBR, or digital board replacement, is already being used successfully by the Spanish soccer league, a sponsor and partner of the revamped Davis Cup. The league says it was one of the first competitions to implement the virtual sponsorship strategy some five years ago, and currently it distributes specific feeds to nine different regions. "It's a format that is much more attractive to sponsors," said Oscar Mayo, the Spanish league's director for international development. "It's a model fully developed and we will share our know-how and provide support." The technology allows for customized images to be superimposed anywhere on the field without being affected by camera movement or the position of players. It is used especially on sideline boards and the 3D carpets near the goals in soccer matches. Similar technologies have been used in broadcasts of auto racing, golf tournaments and American football games, showing speeds, distances and first-down markers to add to the viewers' experience. Kosmos' goal is to have at least three separate regions with specific feeds in this inaugural season, expanding it to more territories and new sponsors in the coming years. "At the end of the day, you can multiply by three or four the income that you are generating because the expense is not huge," Alonso said. The added costs are usually related to the need of having more satellites to distribute the different feeds. Kosmos estimates an extra cost of about 100,000 euros ($112,000) for each additional feed. The plan to use the new technology was already in the long-term plans for Kosmos, the investment group founded by Pique, but it was fast-tracked after longtime Davis Cup sponsor BNP Paribas decided last month not to continue investing in the competition. The bank said it would end its 17-year title sponsorship "as the competition's format evolves". "It was a surprise when it happened but we already had another plan, so we could handle it," Alonso said. "Already with what we have signed (in sponsors), I would say probably we already have 30 or 40 percent of what they had before. 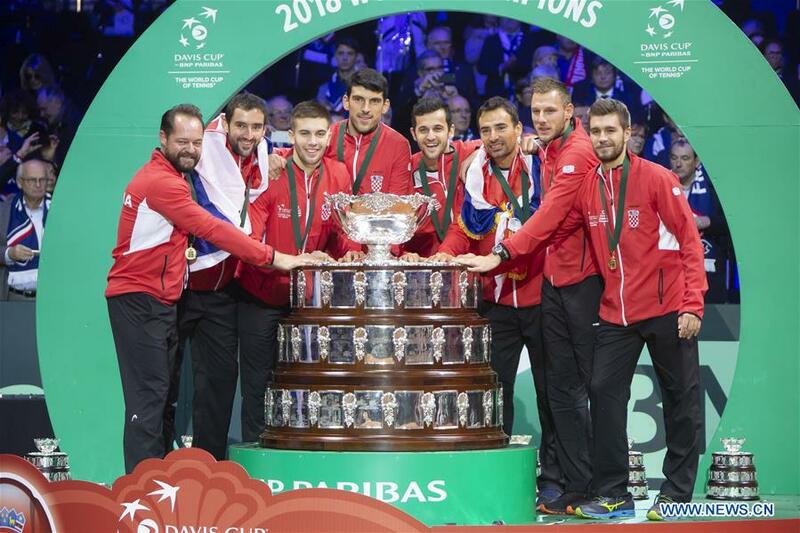 We are OK."
Davis Cup organizers said the new formula, with all matches played in a single week and at the same venue, has been key to attracting new sponsors. "People understand the concept of one city, one location, everyone together, so it's been a good response to the change," ITF president David Haggerty told AP. "Under the old format you weren't sure where the finals would be, so if you were a business you didn't know if it would be a country that was important to your business or not, whereas here everyone knows the next two years we are in Madrid and companies can make a very informed decision." The Spanish league said the new format was crucial for its decision to join in. "This new event has a lot more visibility compared to before," Mayo said. "It will be at the same level as the great sporting events in the world, bringing together fans and players from several countries." The season-ending tournament will feature 18 teams drawn into six groups of three, with the group winners advancing to the knockout stage, along with the two best second-place teams. The nations will play within their groups Monday-Thursday, with the knockout rounds Friday-Sunday. The matches will take place on hard courts in three stadiums in morning and afternoon sessions that will include two singles matches and a doubles match between two nations. The World Cup of Tennis is part of a 25-year partnership between Kosmos and the ITF.